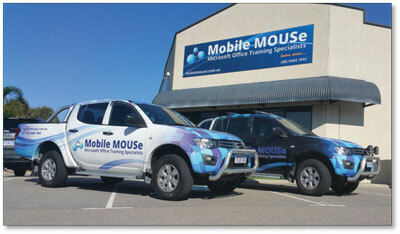 Mobile MOUSe is a leading Onsite Training Course Provider in Perth, Western Australia. If you are not sure which Onsite Training Course is the right course for you, why not take one of our zero obligation online skills questionnaire? STEP 1 - BOOKING AND CONFIRMATION : Contact Mobile MOUSe requesting an onsite training proposal (quote). You will be asked to provide information such as course name, the version of Microsoft Office Training that is required (e.g. 2007 / 2010 / 2013 / 2016) as well as the location of the training and course attendee numbers. We will then issue you with a formal proposal (quote) for the requested date(s). STEP 2 - THE EQUIPMENT : Should you choose to proceed... We provide ALL of the necassary equipment (Laptops, Projector, Manuals, Powerboards and extension cords). We have multiple fleets of very compact, easily portable mobile trolleys which house all of our training equipment. One trolley = One classroom. 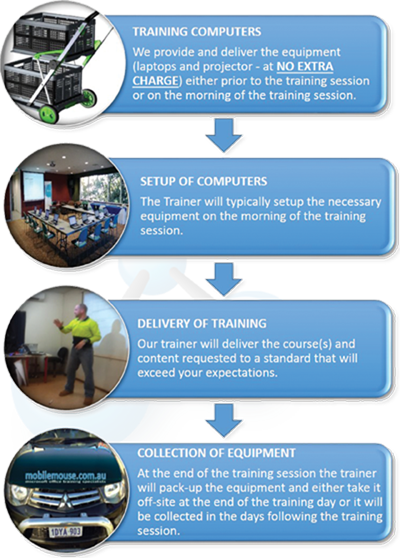 The training trolley will normally be delivered the day before the training or alternatively the trainer will bring in the trolley on the day of the actual training session. If the training trolley is delivered prior to the training, please ensure that there is somewhere secure to house the training trolley overnight. In some regional training instances we may consider shipping the equipment via airfreight (when there is an extended stay required to deliver the training or if the training venue is too far to drive from Perth). STEP 3 - THE TRAINING DAY : The trainer will normally arrive between 8.00am and 8.30am to setup the equipment for the day. Training will commmence at 9.00am (unless a prior arrangement has been made). Please ensure the training room can comfortably accomodate the requested number of students (as well as laptops). Please ensure that the training room furniture is appropriately configured. We also ask that you ensure the trainer has a surface that he / she can easily project onto (such as a light coloured wall, projector screen or a large PLASMA/LED TV with easily accessible connection points). STEP 4 - COLLECTION OF EQUIPMENT : Our equipment will either be taken by the trainer at the end of the training session, or will be collected over the course of the next few days. If the equipment is to be collected, please ensure that there is somewhere secure to house the training trolley until collection. 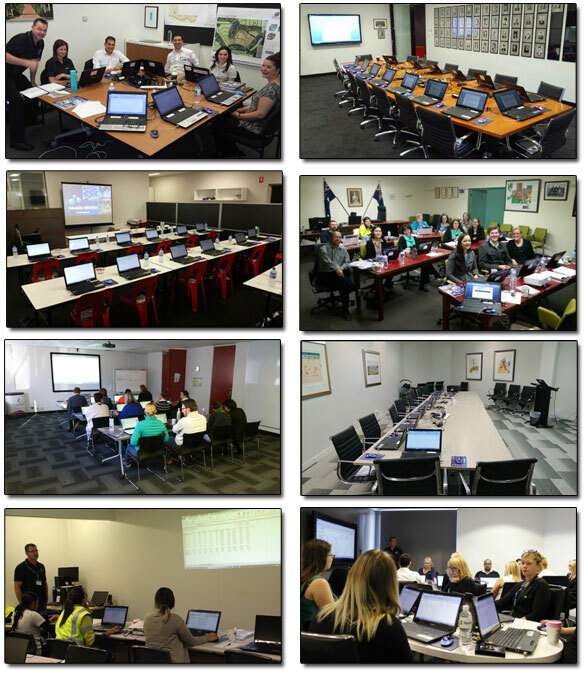 Our Onsite Courses (Training at YOUR VENUE), can be delivered at your premises (office / factory / regional / mine site). With our onsite training options, we come to you with our laptop computers and projection equipment to deliver the course of your choice. Our onsite training options will reduce staff travel times and out of office costs to you. Choose the course location that suits you or your organisation best. Your boardroom, warehouse, office or factory, we can do it !!! We also provide regional training & minesite course delivery options. Our amazing onsite training discounts make our training incredibly afforable (even for small businesses). We provide our own computers & equipment for each student (at no extra cost) for the duration of the microsoft office training at your premises, which means no extra expenses or strain on your internal IT resources. Because we are training your staff (and only your staff) on the day, we can also deliver custom computer courses adapted to suit your exact requirements or needs. Note we also offer catering for this option when you book one of our training rooms exclusively for your staff. Most of our computer training is structured to Microsoft Office Certification, in addition, every computer course comes with free online support.